Four hallowed shrines located at cardinal points of the Indian sub-continent i.e. Puri,Rameswar,Dwarika and Badrinath are believed to have been liked by Lord Vishnu intimately. It is said and believed that He takes His bath at Rameswaram, meditates at Badrinath,dines at Puri and retires at Dwarika.It is therefore,a lot of importance is given to the temple food “Mahaprasad” (not simply prasad) here at Puri. According to ” Skanda Purana” Lord Jagannath redeems the devotees by permitting them to partake his Mahaprasad,to have His darshan and to worship him by observing rituals and by offering of gifts. Mahaprasad is treated here as ‘Anna Brahma’. According to ” Skanda Purana” Lord Jagannath redeems the devotees by permitting them to partake his Mahaprasad,to have His darshan and to worship him by observing rituals and by offering of gifts. Mahaprasad is treated here as ‘Anna Brahma’. The temple kitchen has got the capacity to cook for a lakh of devotees on a day. 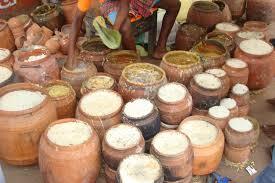 Mahaprasad is cooked only in earthen pots and medium of food is fire wood only. The steam-cooked food is offered to Lord Jagannath first and then to Goddess Bimala after which it becomes Mahaprasad. This Mahaprasad is freely partaken by people of all castes and creeds without any discrimination. The items offered include cooked rice, dal, vegetable curry, sweet-dishes, cakes etc. Dry confectionaries are prepared of sugar, gur, wheat flour, ghee, milk and cheese etc.When the steam cooked food is carried to Lord in slings of earthen pots no mes up from the food but when the same is carried back to the sale point after being offered to the Lord a delicious smell spells along in the breeze to the pleasant surprise of the devotees. Now the food is blessed. Mahaprasad consolidates human bond, sanctifies sacraments and grooms the departing soul for its journey upwards. Mahaprasad are sold in Anand Bazar or the Pleasure Mart of the temple which is situated on the north east corner of the outer enclosure of the temple. It is the biggest open-air hotel in the world where every day thousands of devotees purchase and eat together forgetting their caste, creed and status. Most of the residents in and around Puri depend upon this Mahaprasad to entertain their guests during social functions such as threading and weddings. The tourists prefer to carry a particular type of dry Mahaprasad known as” Khaja” (made of maida, sugar and ghee) which stays fresh for days together.